THE REASON for Christmas , the birth of baby Jesus, goes back more than 2,000 years. And we shouldn’t forget that. Modern Christmas just wouldn’t be the same holiday without Santa’s red suit and Rudolph’s red nose. You have to add some green in there, too … holly branches and mistletoe, for instance. Today’s Jolly Old Elf goes back to a Coke commercial in 1931. Also, Rudolph had a boring, just-like-everybody-else nose until Cowboy crooner Gene Autry sang about him on his Melody Ranch radio program on October 8, 1949. Johnny Marks wrote the song, though it’s often attributed to Autry. Cranberry strings on a green tree is old-timey, but using the same colors in the food you serve on the festive table is delicious. And where else would we look for said food? Why, Central Florida, of course. No matter what your dinner centerpiece, an edible garnish doesn’t get much easier than an edible wreath of tiny tomatoes and broccoli florets. Ham, turkey, beef, chicken, crown roast of pork, even mac and cheese or veggie lasagna for vegetarians all get fancy with Florida red and green. New, early varieties of strawberries are hitting the stores and some of them should be a gift to diners when presented in a congealed salad. That’s fruit and/or vegetables in Jell-O, to you Yankees and Canucks. There is a simple way to get the same holiday feeling. Make a double batch of lime gelatin in a Bundt pan. Unmold it on a pretty platter and fill the center with sliced strawberries. Garnish the outside with holly, real or just looks real. Here’s a colorful salad for the start of a meal to balance a decadent dessert at the finish. Pomegranates are a Florida crop, but almost all you find in the stores are from California. 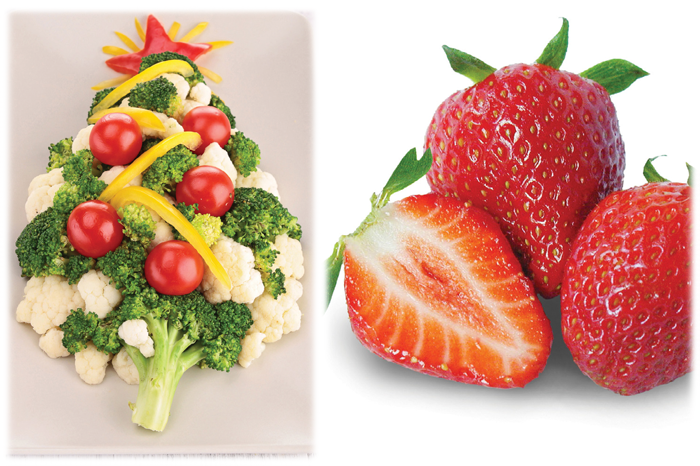 Add some juicy red seeds to the berries in Red and Green Salad anyway. Sugared Pecans: Melt 2 tablespoons butter in a small frying pan over medium heat; stir in pecans and 1/3 cup sugar. Toss and cook until well coated. Cool on waxed paper. Combine greens, strawberries, onion, and the sugared pecans in a salad bowl. Mix dressing ingredients then toss with the salad. Add pomegranate seeds. Chill and serve. Makes 4 to 6 servings. If you have guests who are watching their weight, and those who aren’t, make a pretty nibble from cucumber and tiny tomatoes. Slice the cucumbers about a half-inch thick. Add a touch of low-fat salad dressing and top it with a half of a grape tomato. If a splurge is in the budget, top the cucumber with a small piece of prosciutto before the dressing and tomato. Creative cooks who have a little time to work on it can build a super Christmas tree centerpiece, big or small, with a green Styrofoam cone, broccoli florets, grape tomatoes, circles of yellow squash skin, orange zest, long paper thin slices of carrot for garland, and grated parmesan cheese for snow. Guests can dip the decorations in the dressing of your choice as they deconstruct the tree. Look for toothpicks on sale. Or, skip the Styrofoam cone and decorate your Christmas tree appetizer on a large serving platter. Simply chop bright red Florida tomatoes, add chopped green pepper and onion and flavor it with lime juice and as much cilantro as you like. Serve in green peppers or Florida grapefruit shells. And, back to Rudolph, if the composer had been from Scotland, we might be singing about Rudolph the plaid-nosed reindeer. Merry Christmas, and happy holidays.